The museum is in downtown Vegas, not out on The Strip, and is housed in a former Post Office/Federal Building. The Museum has done a super job restoring the exterior of the Beaux Arts building which is a world away from the glitter and glitz that's modern touristy Las Vegas. The building's interior spaces, where employees of the Post Office, a branch of the Federal Government, used to sort letters addressed to Santa Claus (at least according to Miracle on 34th Street), have been largely refashioned into exhibit spaces, but the main courtroom has been preserved and is incorporated into the museum experience. The admission fee is $20, which was the “suggested donation” was at the The Metropolitan Museum of Art in New York the last time I went there. Bargain hunters should know that you get a lot more objects per admission dollar in New York than you do in Las Vegas. But hey, you can't stand in a mock lineup at The Met, can you? 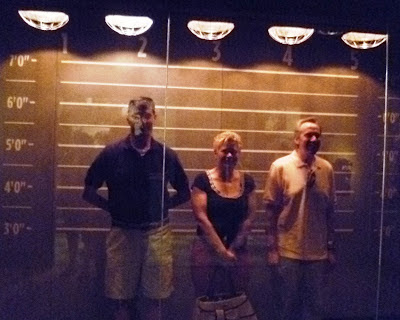 The admission at The Mob Museum is somewhat less if you’re a local, and yes, they want to see your ID. Apparently they aren’t about to let the crime pay when it comes to lying about your residency. The museum covers four floors. The exhibits are mostly text panels and videos along with the occasional cheesy interactive station. These include shooting a fake Tommy gun and mixing up some cement for overshoes. OK, I was kidding about the cement. But not about the Tommy gun. The museum is a quart low on artifacts since no one has seen fit to donate stuff like some .357 shell casings and the bullet riddled dry cleaning receipt that was somehow missed by the CSI people after Clemente "The Rototiller" Pelliccia was rubbed out on leaving the One Hour Martinizing Shoppe in Bayonne, New Jersey in 1969. 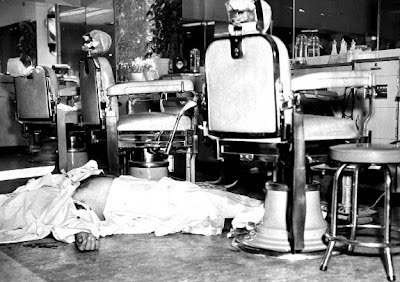 Of the few actual artifacts, the niftiest slash most macabre is the actual barber chair in which Albert Anastasia, of Murder, Inc., was sitting when he was whacked in the Park Sheraton Hotel in New York City on October 25, 1957. That crime remains unsolved. The label stated that the chair was formerly owned by Henny Youngman. Take my mobster, please. 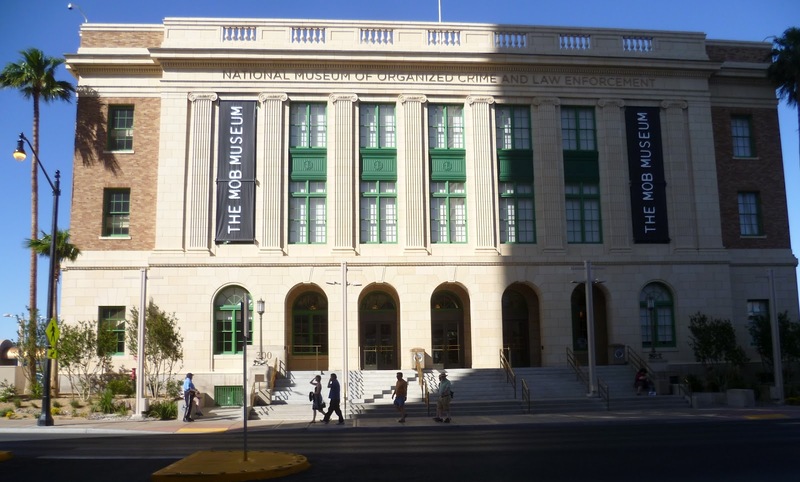 The most engrossing thing at the museum was a film that connected Lee Harvey Oswald and the assassination of President Kennedy to The Mob. I am not a big conspiracy theory guy, but the film laid out compelling evidence that connected Oswald to the Mafia. This was via his Maytag repairman, a strawberry blond girl named Lurleen who rode Oswald’s school bus and her next door neighbor's 1957 Desoto, maintained by a mechanic who wore the same size trousers as Sam Giancana. Hence....The Death of the President. Yes, I knew you’d believe it right away too. I loved the gallery filled with crime scene photos of mobsters who had been rubbed out. There was a sign that said that this gallery was not for the squeamish, which, of course, reminded me of those signs at movie theaters in the 1950s that warned of patrons being literally scared to death at some Grade B horror film. Naturally, I made a bee line into that gallery. There they were, black and white glossies of various mobsters you'd never heard of in the front seat of a car, gaping bullet hole in their head; or on the sidewalk in a pool of blood. When it came to retirement, mobsters seemed to prefer a slug from a .38 to a 401k. There was also a representation of the electric chair. It was sort of a hokey. I mean, does anyone except possibly one of the stars of Bravo's Million Dollar Decorators believe that in any prison, anywhere, there ever was a melon colored electric chair? I mean, really. I would die of embarrassment before they hooked up any electrodes if I had to sit in that thing. It would, however, have been a cool interactive feature if you could have thrown the switch for the chair--to the right in the photo--and have the lights in the building dim for a moment, just like in old movies when No Good Frankie finally gets fried in the Big House. Oh the career I've missed as an exhibition designer! After learning to shoot the fake Tommy gun, enjoying the JFK conspiracy film, taking in the mob hit photos, and the JFK conspiracy film, and even learning how to spell Estes Kefauver, I spent some time in the gift shop waiting for Tracy and The Other Rick. 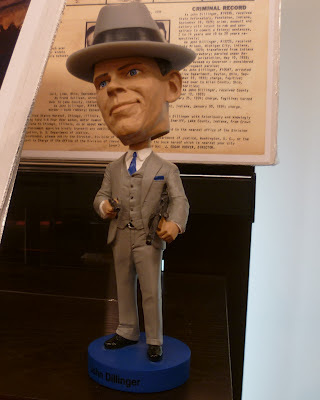 Yes, they sell John Dillinger bobblehead figures. When I was a kid I heard that Dillinger's personal weapon (so to speak) was in a shoe box at the FBI in Washington, DC. I think I believed it too, though I never did work through the issue of whether it would have been been wrapped up in tissue paper like a new pair of shoes. Tracy was the last to come out, she’d been particularly engrossed the Hall of Animatronic Mob Wives sponsored by Fingerhut Plastic Sofa Covers. Later we discovered it they weren't Animatronic Mob Wives at all, instead they were just clips from The Real Housewives of New Jersey on a big screen TV. 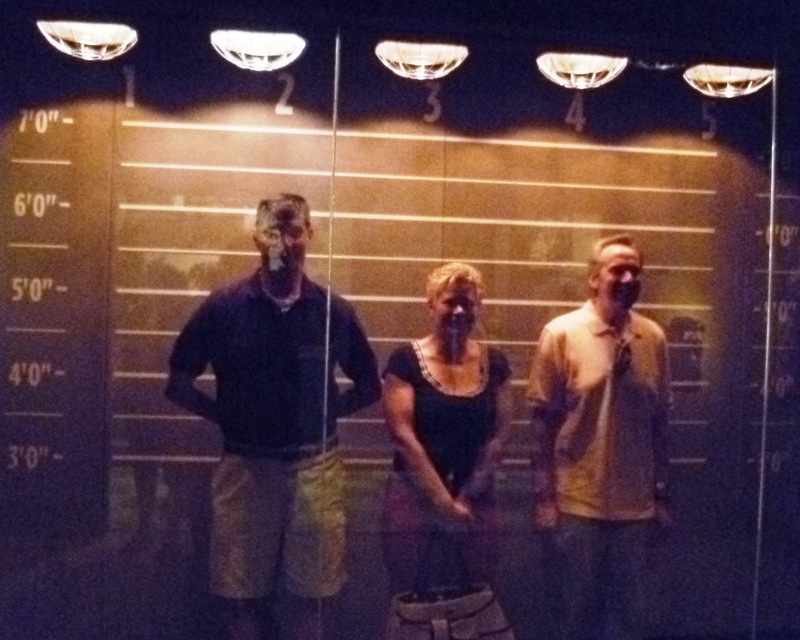 OK, The Mob Museum is not The Met. Or the Hall of Drag, I mean the First Ladies Gallery at the Smithsonian. But for the average organized crime aficionado The Mob Museum is worth the $20....especially if you pay with a crisp $20 bill signed by Secretary of the Treasury Meyer Lansky. "interactive feature if you could have thrown the switch for the chair--to the right in the photo--and have the lights in the building dim for a moment"...only you, although it would be a brilliant feature!